In February of 2016, Metro established the Unsolicited Proposal Policy, opening its doors to the private sector. The policy allows any company to submit a proposal on any idea and encourages the private sector to tell us what we could do differently. The policy signals Metro’s willingness to implement ideas with financial and/or technical merit. Metro has thus far received 82 unsolicited proposals. Of those, 75 have been reviewed to date, five are still being reviewed and 22 have advanced to a more detailed analysis. Five ‘innovation pilots’ have been implemented or will be in the coming months. These proposals run the gamut, including: software aimed at avoiding unplanned computer outages; better software and hardware to determine the real time location of buses; using smart phones as virtual tolling equipment on the Metro ExpressLanes, and; improving the Orange Line by giving bus operators better information on upcoming traffic signals. Working through these diverse proposals has been a true team effort. OEI has engaged over 100 subject matter experts from around Metro to review, analyze and act upon these ideas. This level of engagement has led to more cross-departmental conversations and greater understanding of how decision makers at Metro — and the industry at large — are thinking about some of their most critical challenges. New mobility services that take advantage of GPS and smartphone technology. Paying people not to drive and other methods to incentivize mode and time shifts. Improving data access and management. Improving the customer experience on the bus by speeding up travel times, providing better information and increasing security. The most significant focus area for Unsolicited Proposals is major capital projects. Projects of the size and magnitude seen in Measure M take a long time to develop, but the substantial progress made in the first year gives Metro confidence that Unsolicited Proposals will improve timelines and outcomes. 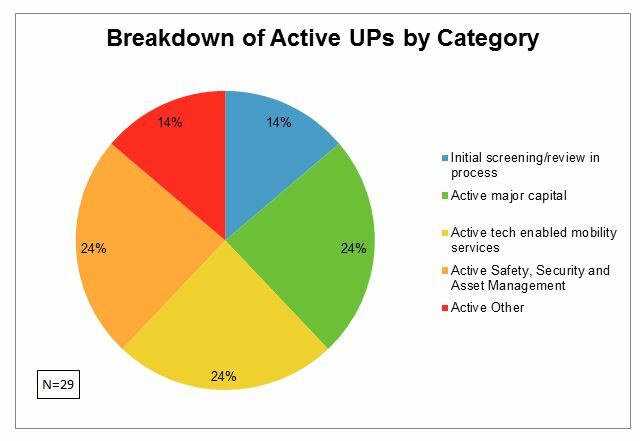 The timeline above charts OEI’s progress on UPs for capital projects in our first 18 months. 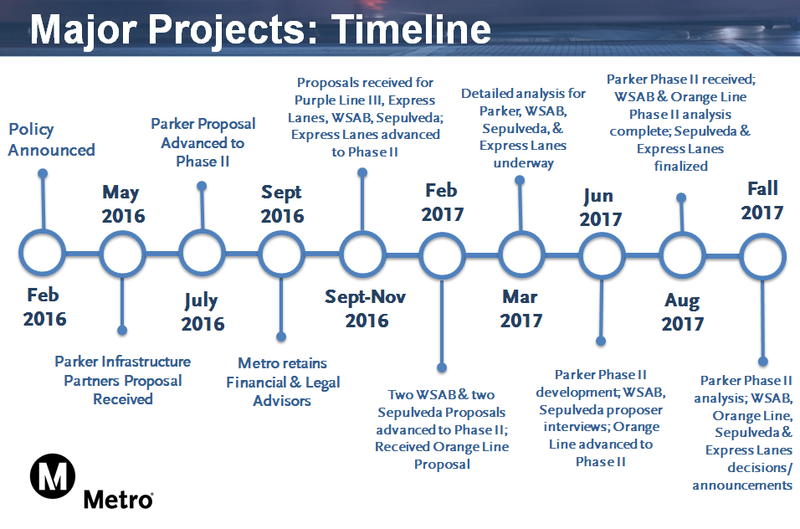 Seven major capital unsolicited proposals had enough merit for a more detailed analysis by Metro staff, who are working with financial and legal advisors to evaluate these public-private partnerships. We’ve seen enough good ideas so far to believe that the next fiscal year should be a very exciting one for Metro. Let’s hope that some of these proposals have enough merit to accelerate some of the more important transit projects! I rather not wait until 2040s to ride them if we don’t have to.